Socialist Democracy (Ireland) updates us on the consequences of the continuing slide to Right in the Six Counties. If one thing links the political systems on both sides of the Irish border it is political corruption. Corruption so open, invasive and blatant that it would be comic if not so harmful. However the northern corruption has the added dimension of ongoing capitulation to loyalism, a capitulation that offers effective impunity to loyalist groups and has now reached the stage where the paramilitaries, in collaboration with the Democratic Unionist Party, are given a free hand to write the rules to suit themselves, setting the scene for the coming bonfire and Orange marching festival. Yet this is not the full story. Sinn Fein, in Belfast City Council, has signed off on this arrangement, which they attempted to conceal from the public. The policy of capitulation has now been underlined by Taoiseach Leo Varadkar in his handshaking ceremony with Orange bosses. Nationalist workers facing intimidation during the coming hatefest should keep their heads well down. Nationalist leaders will not support them. The role of Sinn Fein and Varadkar also tell us that there are no restrictions on restoring a Stormont just as corrupt and sectarian as the defunct version that died in 2016. The background to southern corruption is well known. Story after story emerges from the police, the health service, education, charity, government, local government and so on. Garda leaders who lost their phones, politicians who front for property developers and women’s health sacrificed in outsourcing deals that also strip out key elements of health provision from the local structures. In the South the overwhelming corruption of a government acting as agent for European and other transnational capital is only rivalled by the rapacity with which they sponsor local landlordism and property speculation. In the North stories of corruption are spiced with open criminality and sectarianism. The massive £500 million RHI cash for ash scam is only topped by the open alliance between the Democratic Unionist Party and paramilitary criminal gangs that are still formally classified as illegal. Yet what is striking in both states is the level of impunity. Criminal acts, the theft of public money, all occur in the open. Behind short lived shouts of protest lie a dull resignation and a conviction that nothing can be done. Why is this? The welfare state is dying across Europe but it never fully arrived in Ireland. The welfare system imposed on Unionism by Britain is being demolished. The idea of a political and economic system that would deliver a decent life for all seems unreachable. Workers vote for people they know are crooks. The reasoning is that if they steal for themselves they might steal something for their constituents. Even better, they might become a minister and a divert money to the area. In the North the ideology of conflict resolution embedded in the peace process and in the political and social structures reset everything even more firmly in terms of sectarian division. The vast majority accept mass bribery and a large degree of legal impunity for loyalist groups and, to a much lesser extent, for Sinn Fein. They accept that there are few fully independent community groups and that Sinn Fein, the DUP and loyalist paramilitaries are embedded throughout civic society and soaking up public funds. One element of this acceptance is simple adaptation. This may not be the society that workers expected when they voted for the Good Friday Agreement, but it is the one they have and their main concern is to survive and try to build a decent life for themselves. Another factor among nationalists is defeat. Decades of struggle against the state have ended with their own leadership embracing that state. The sensation of defeat does not lead them to spontaneously resist but rather to hold more tightly to their existing leaders. Above all there is a belief that the system of bribery will succeed. After all, it worked with Sinn Fein and led to the disbandment of the IRA. It appears to have worked with demonstrations demanding permanent display of the union flag from public buildings (the “fleg” demonstrations) and with the Orange marches. Torrents of public money in excess of £50 million appeared to have settled the violent confrontation at Ardoyne. Further bribery of the loyalists should settle the violence and intimidation around loyalist bonfires, gradually decrease the level of loyalist thuggery and, if not leading to a democratic society, should at least lead to a low-level and fairly harmless rivalry between communities for resources. Anything with challenges this belief is ignored. So it is not the case in any confrontation with loyalism that bribery by itself was enough. The bribery was always accompanied by major concessions to the loyalists. For example, in almost every case conflicts around Orange marches are resolved with the Orangemen continuing to march. The Ardoyne compromise involved the Orangemen continuing to march through the area on their outward trip and also involved a side deal where anti-internment marchers are now barred from the city centre. A case study exposing the mechanisms of this culture of bribery recently unfolded at Belfast City Council’s Strategic Policy and Resources Committee, where “community groups” were awarded a combined £400,000 for “bonfire diversion”. The UDA-linked Belfast South Community Resources (BSCR), is getting £26k. BSCR is based in the Sandy Row area of Belfast. In the past it has been linked to the UDA and received money from Stormont’s controversial Social Investment Fund. SIF money bought a £700,000 Sandy Row office block, where veteran loyalist “brigadier” Jackie McDonald conducted UDA business. DUP MLA Christopher Stalford has his constituency office in the same block and was prominent in defence of a bonfire mob who seriously damaged private apartments in the area last July. The DUP, the UVF front the PUP and Sinn Fein have form. 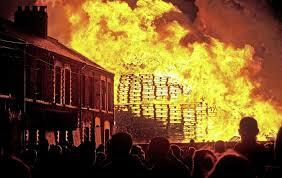 Last year it was found that the council was storing bonfire materials, some of which were certainly stolen. They disappeared from council storage to reappear in loyalist hands. On this occasion the press were excluded from meetings, a call-in mechanism that would have allowed other councillors to challenge the decisions was removed from the process. Money went to community organisations closely linked to Sinn Fein and groups sponsored by the DUP, many other community initiatives went unfunded. To add insult to injury over £100,000 originally earmarked for a Belfast – European city of culture bid was thrown in the pot. Nor did we have to wait long to see the results.East Belfast saw an announcement that the most dangerous bonfire of all, responsible for mass evacuation of local homes in 2017, is to be moved to the next street. Local loyalists will have their palms covered with silver and none of the issues of pollution and fire danger will be addressed. Simultaneously in East/South Belfast, both areas where “community groups” were financed by the City Hall, a voluntary protocol on flags was agreed within the narrow loyalist circle of the DUP and the loyalist paramilitaries. The flags will only fly from June until September, although if there is some delay in removing them the organisers are sure everyone will understand. Only legal flags will be flown; the union flag, the loyalist version of the Ulster flag and original UVF flag. This distinction between legal and illegal flags is only of importance to the loyalists and as a cover for police inaction. To everyone else what is at issue is the long history of marking out territory and intimidation of nationalists. Any loyalist flag at your door carries the same message. Underlying the chaos lies the fall of the local executive. That fall was part of a long decay. Many issues simply could not hope for unionist agreement and were simply parked for consultation- in effect a declaration by nationalism that they were willing to concede these issues. A recent example was a report on bonfires that is running indefinitely and has cost £600,000 so far without any conclusions. In the absence of an administration the local councils run the show. In areas dominated by unionists intimidation stays as before. Nationalist councils try to apply safely and pollution issues but are handicapped by their own wooing of the loyalists and by police unwillingness to uphold these rules when it comes to loyalism. In Belfast the practice of the sectarian deal has become an art form. So rules about pollution, fire risk and the destruction of property no longer apply. Intimidation can now take place in an open way because only legal flags and “anti-terrorism” banners will be used to force residents out. The unofficial practice of the state in turning a blind eye is now official. The cultural clash defined in the peace structures is now an overwhelming ideology. Sectarianism is now defined as anything that offends loyalism and is so universal that trade union leaders and sections of the reformist left hold to it. It is against this background that Sinn Fein can strike corrupt sectarian deals and there is nothing to keep them from returning to Stormont and rebooting the Assembly. They signed off on everything they were asked for in the last talks, but the DUP were unable to deliver even the most watery elements of an Irish language agreement and in any case no longer support devolution, preferring the direct protection of imperialism at Westminster. Yet Varadkar’s project of a modern 26 county state, economically conservative and socially liberal, looks doomed in the face of the ongoing corruption and the ever increasing demands of vulture capitalism and the Troika. His assertion that the 26 county state are simply neighbours a separate entity in the North flies in the face of popular support for Irish unity. Sinn Fein’s vote in the North, declining for years, shot upwards when they withdrew from the assembly. Many young supporters are unhappy with capitulation and the outcome of a return to devolution would be a further erosion of nationalist working class support for the party. Given that they party now look forward to coalition with Fine Gael in the Dail, their ability to retain a left image and the support of sections of the working class is in question. Last year workers who wanted to escape housing apartheid in accommodation especially built as part of the Good Friday Agreement were sacrificed to loyalist intimidation. This year that sacrifice was sanctified by Irish nationalism.